Here is Dale's popular local cross-country triangle. 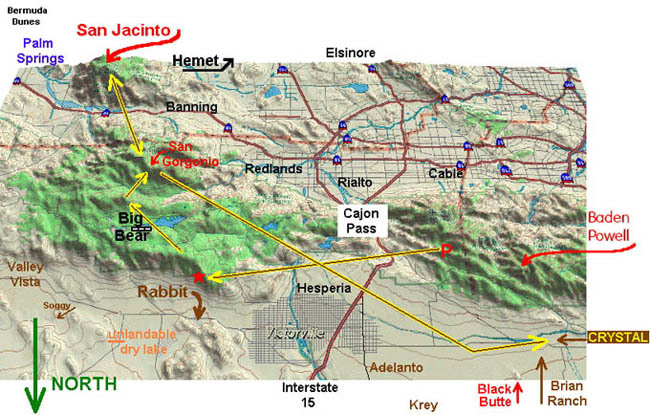 On this route we typically fly 100 miles or more without ever going beyond glide range of CRYSTAL. The fuzzy yellow-green lines indicate approximate positions of common shear lines that separate distinctly different air masses. 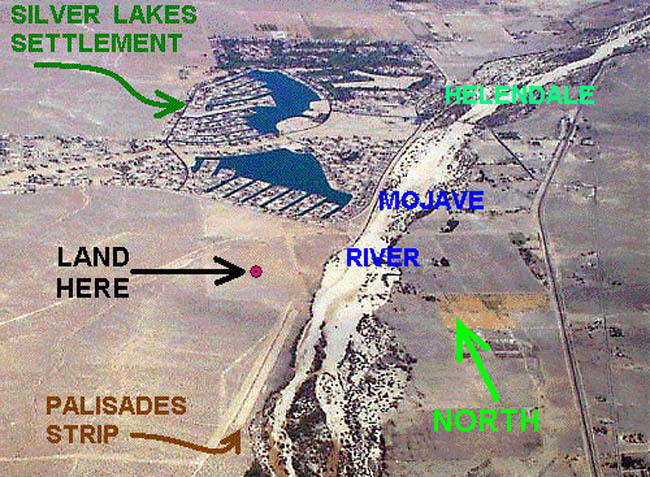 El Mirage and CRYSTAL lie within a large area of buoyant Mojave air, while Hesperia and Palmdale are embedded in lobes of relatively more humid marine air (shaded in this image) flooding into the desert through the passes on either side of the San Gabriel Mountains. 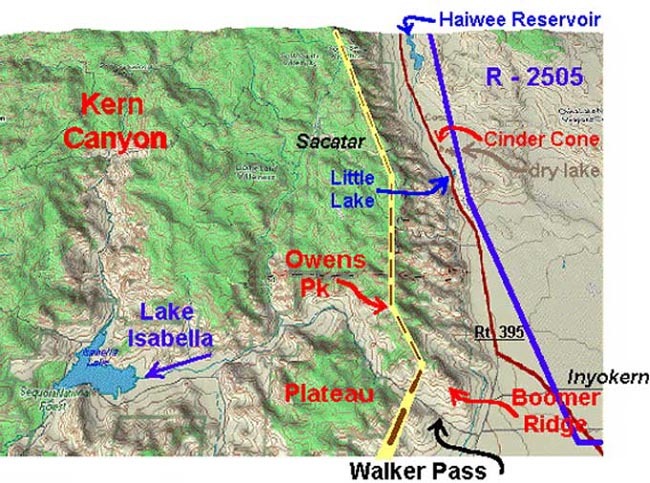 Our second leg will be forty miles if we run west from Silver Lakes all the way to the corner of Restricted Area 2515. Out there the lift may not be as good, but there are many fine places to land if necessary (hasn't happened yet…). Then, from Lancaster to CRYSTAL is only 25 miles or so, an easy glide from any ordinary thermal. 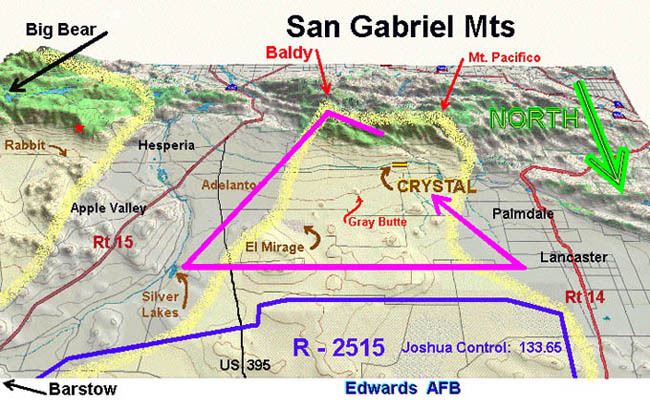 Also, notice that from the eastern corner a direct return to CRYSTAL would take you over several small hills before and after El Mirage. 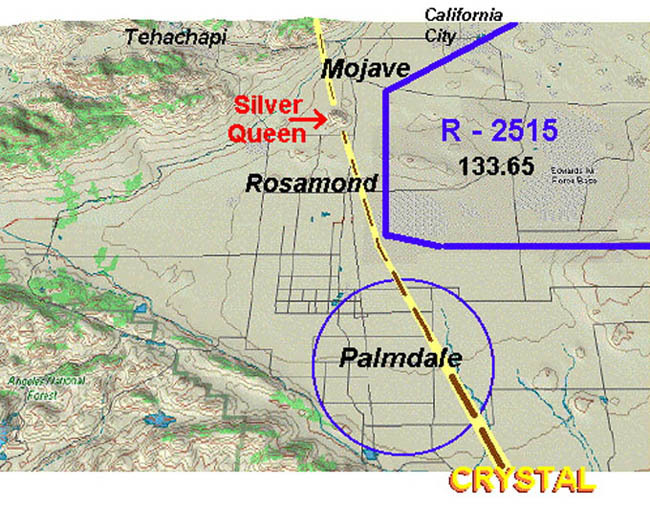 In fact, a straight line glide from Silver Lakes to CRYSTAL is often made, over 30 miles at good altitude and speed, with no loss of altitude! Below is a photo of the Silver Lakes turnpoint, looking NORTH. To find this field from the ground, leave the National Trails Highway (old Rt 66) at the Silver Lakes turnoff, cross the (dry) Mojave River, and bear left at the intersection where there is a store. Drive south between the river and a walled development, beyond the edge of town. Go on dirt roads left of the highway, up & to the right, into the southern of two huge fields. Given that development, the strip is actually a better landing surface - and the owner is reputed to be FRIENDLY ! Seen from the air, the preferred field usually displays a tiny airport mowed out for radio controlled model planes. This time we'll try something more challenging. How about Crystal to Mt. San Jacinto and return? The turn point distance is only 80 miles from here, but we'll have to fly a good bit farther than 160 miles to get there and back. The entire route is depicted in one image - but viewed from all four cardinal directions. Imagine what it's like to soar from Crystal, 235 miles north to Boundary Peak and then back, using a different route each way. You could correctly say that such a flight is a very ambitious undertaking, but it's far from impossible. First, avoid a head on collision. Print out, memorize, and take with you the WHITE MOUNTAIN SAFETY PROCEDURE ALPHA card (PDF 51kb). In this first phase we're departing Crystal to the northwest after climbing to 14,000' or so in the San Gabriel mountains. We turn the southwest corner of restricted area 2515 surrounding Edwards Air Force Base. Be sure to call Joshua Control on 133.65, to let them know we're coming by. On weekends we might even to ask permission for overflight. Weekdays, forget it and just fly around to the west. 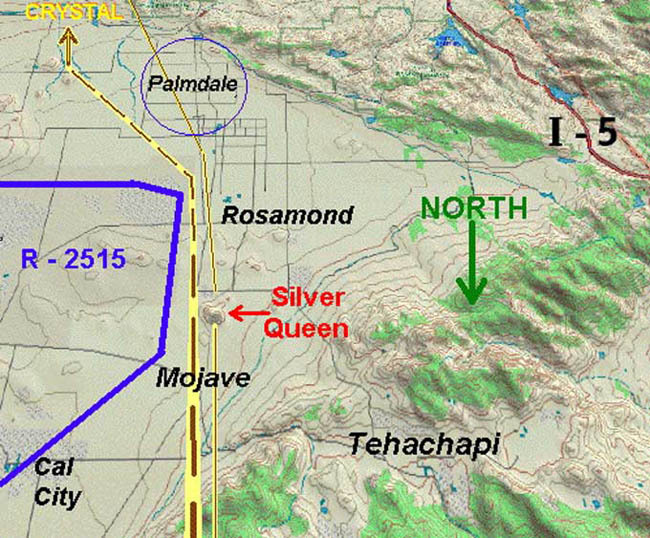 The very first hill after leaving the San Gabriels is Silver Queen, 45 miles out, just beyond Rosamond. This small conical hill is a very good thermal source with a fine private landing field (not on the sectional chart) a couple miles south. In this area we look for SHEARLINES. 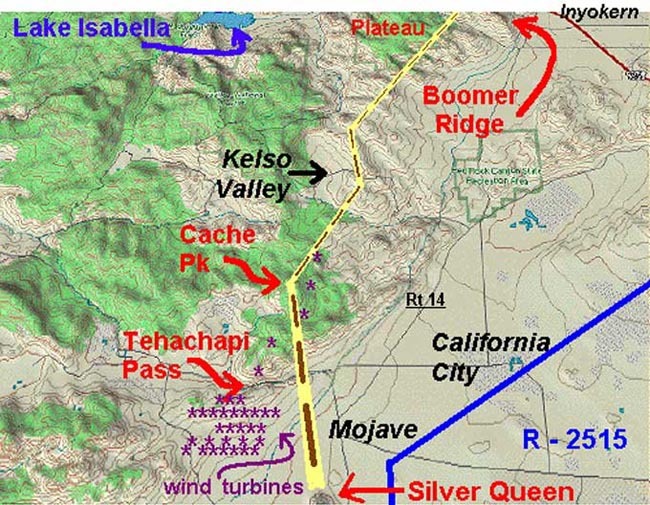 They form around the Tehachapi Pass, and we can use the wind turbines, for critical information about wind directions. In lighter conditions, we just climb onto the east facing slopes and then top out at Cache Peak before moving on. 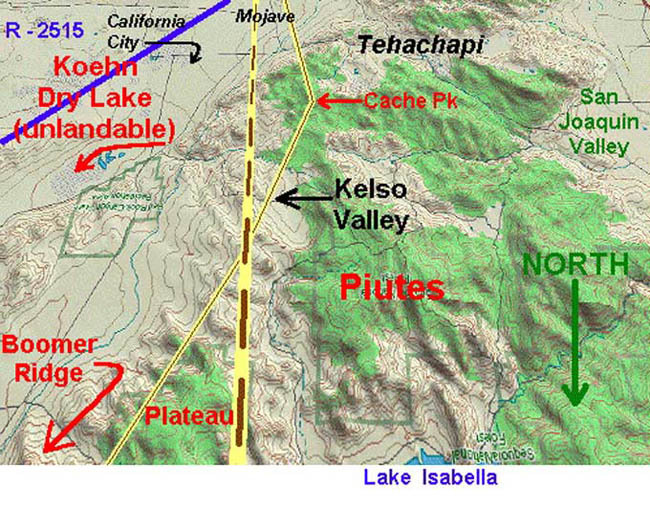 The Plateau is a broad, fairly flat forested area about 6000 feet above sea level - well above the surrounding desert. It is not a good place to glide over low, but the edges of it usually produce fine thermals. From great lift at Boomer, we proceed up the crest to 8000' Owens Peak, and if we're not already very high, it may pay to loiter in this area until we do get high. 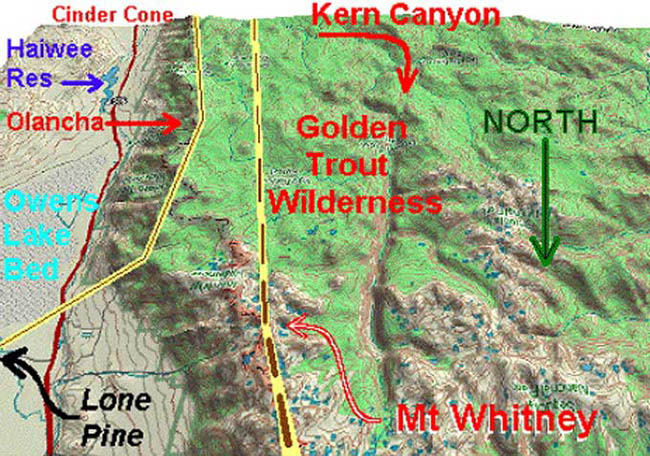 We're now on the main watershed of the Sierra crest, and it will rise MUCH higher ahead. 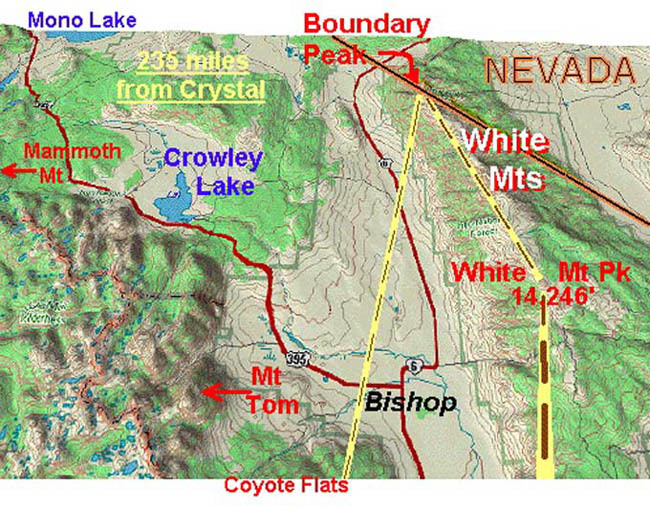 If we leave Owens Peak low, we could be shot down and need to land at Cinder Cone Dry Lake. In this area the soaring conditions often change - usually for the better. If we stay with the first good thermal we find, we might be able to climb to 16,000' or even higher, and maybe remain that high for many, many miles to come ! If the usual tremendous thermals aren't working, it is some sometimes possible to simply slope soar the whole way, gradually rising with the terrain. In other conditions, we might fall off to the east, below the ridge top, and then find good shear line - or just periodic thermals above the flats. Wave is also a possibility. Here we're ready to cross the Owens Valley (20 miles with not much lift) to the Inyos, a huge, bare rock ridge that spawns some of the greatest thermal lift on Earth. (Don't forget your White Mountain Procedure Alpha card). 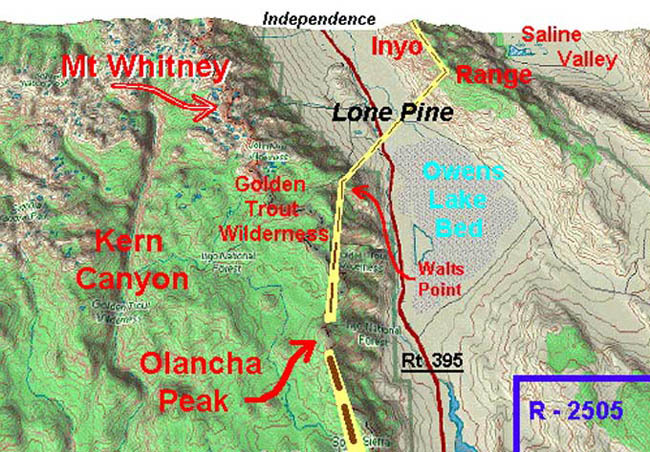 If we arrive at the Inyos no lower than 8,000' a quick, high climb is almost guaranteed. It pays to get high soon here, and then stay directly above the crest, cruising from one tremendous mile of lift to the next. A slight dogleg to Waucoba is usually worth the little extra distance, to stay in more continuous lift. 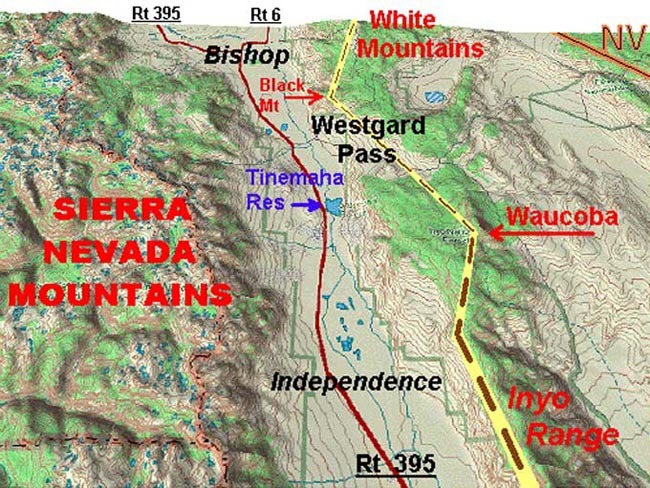 After Waucoba, Westgard Pass is thirty miles of low, rugged hills and less lift. Unless there is an obvious line of clouds, the best bet is to run directly for Black Mt and another sure climb. Otherwise, arriving low at the southern end of the Whites can become too time consuming. 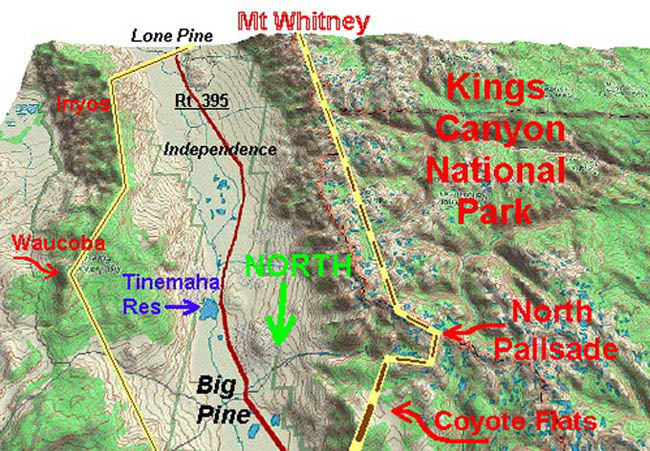 White Mountain Peak is the highest point in California outside the Sierras. It is hard to imagine a more prolific thermal source anywhere. From there the lift is usually even more continuous the last 15 miles to our turnpoint at Boundary Peak. From Boundary we can see forever into Nevada's Great Basin, and northwest to Mono Lake. Turning south, a shear line often runs diagonally across the wide north end of the Owens Valley north of Bishop, and with average luck we can use it to cross all the way to the Sierras, perhaps remaining as high as 16,000 feet ! As we ride along the Sierra crest, we have one delicious landscape below us and very different ones on either side. To our west lies a stark landscape, all above timberline - nothing but naked rock and thousands of exquisite lakes, descending into huge forested canyons that disappear in the distance. Running down the Sierra crest, we porpoise from one stunning pinnacle to the next. To our east the Owens Valley is itself a unique landscape, 2 miles deep and 20 miles across. A few miles after Whitney we soar out over forest for the first time in more than 60 miles. Often in the afternoon the strongest line of lift runs several miles west of the crest, with cloud base typically around 15,000 to 17,000 feet all the way back to Inyokern, or beyond. 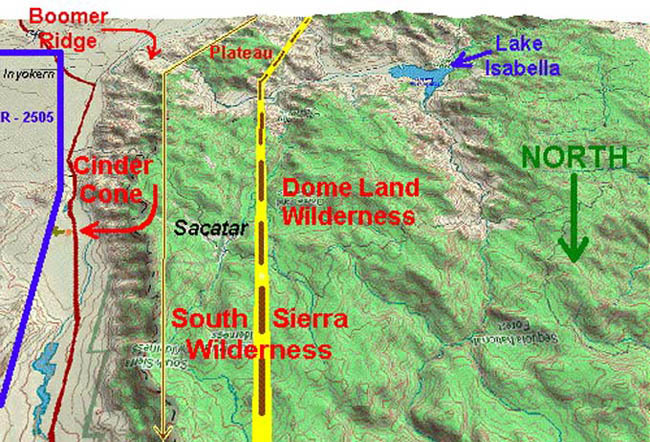 However, if we're unable to reach final glide altitude at Rosamond, we may need to finish our flight by tiptoeing across the wide, flat expanse pictured above.